The Caligare's software products and services are unique to the world market. Similar products with fewer features and a lower level of safety exist, but our netflow software solution and customer relations skills help give us a competitive advantage. We are confident in our quality product, our staff qualifications, skills, experience and a friendly and professional customer approach make us a reliable business partner for you. Quick Installation Auto-install from CD or download and burn CD-ISO image. Quick and easy install with no technical knowledge required. Web Interface Familiarly, comfortable and wide accessible user interface. Easy access to configure collectors and all parameters. Your customers can access statistics from anywhere at that moment. 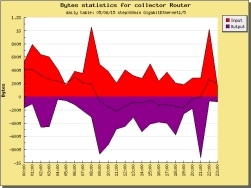 36 Trend Statistics View historical or actual reports with many types of data traffic filtering. Possibility to find top talkers, conversations, interfaces, detected applications, protocols, autonomous systems etc. View reports on what makes up the bandwidth usage, find and troubleshoot network problems. Quickly see what is happened in your network. Interface Statistics Input and output interfaces utilization with ability to filter traffic. Quickly view the interface utilization. It can be used for finding bottlenecks in your network. Utilization Maps Anonymously accessible images with objects. Each object is computed in 5 minute utilizations. You can include traffic graphs into your corporate web pages. Application Recognizer Software includes heuristic methods for recognizing applications. Possibility to specify own applications. Built-in peer-to-peer application rules - Direct Connect, Gnutella, E-Donkey etc. Group Rights and View Restrictions Configure access rights, IP range or interface restrictions for any user group. Set group role (e.g. administrator, guest, collector maintainer etc) and view restriction for your customers. IP Address Detail Get full detail about hostname. Find country, autonomous system, host status etc. Autonomous System Detail Query whois server to get all details about Autonomous System. Useful for service providers to find contact information of other ASes. Query results export Send results to CSV file or send it to email address. CSV file can be opened in the external software (e.g. Excel). Table export Any data table can be exported, backed up and imported anytime. You can export old tables to external mass storage devices. Networks Configure monitoring groups based on a specific IP address, range or network. Quick specification of searching criteria. Profiles Save trends or search conditions into user or global profile. Search queries can be quickly and simply reused. NetFlow Forwarding Redirect NetFlow data stream to another collector(s). Useful for external data analysis. Configuration Generator Create NetFlow Configuration for Cisco IOS/CatOS devices. Easy cut-and-paste configuration into your device to activate NetFlow export. Anonymous login Enable anonymous access with configurable restrictions. Guest access without password. LDAP authentication LDAP server is used for authentication. Uniform access method in the corporate environment. Skins Customizable software face. Administrator can define own skins. Multilanguage Set language closest to the user. Software can be translated into any language. Graph types Accumulated or non-accumulated bar, line or spider graphs. Possibility to use suitable graphs. Graph resolution Each user can set graph resolution. Fit user needs. Distribution A fully distributed system; only limited by platform size. Each component of the software can be installed on the separate server. Caligare Netflow Inspector has the following basic characteristics (different searching conditions): i.e. protocol (TCP/UDP/ICMP/...), source/destination IP address or IP intervals, source and destination ports. These statistics can vary according to type of data set up in the table. The advantage of this type of application is to have a heuristic detection ability in various types of applications (i.e. : Microsoft Exchange, passive FTP transfers, P2P clients (like direct connect, gnutella, kazza). Read article detecting network anomalies and worm infected station for practical example of Caligare Flow Inspector tool. Top source hosts per byte. Top source hosts per packet. Top destination hosts per byte. Top destination hosts per packet. Top hosts conversations per byte. Top hosts conversations per packet. Top source TCP/UDP ports per byte. Top source TCP/UDP ports per packet. Top destination TCP/UDP ports per byte. Top destination TCP/UDP ports per packet. Top source interfaces per byte. Top source interfaces per packet. Top destination interfaces per byte. Top destination interfaces per packet. Top interface conversations per byte. Top interface conversations per packet. Top source ASes per byte. Top source ASes per packet. Top destination ASes per byte. Top destination ASes per packet. Top AS conversations per byte. Top AS conversations per packet. Top next hops per byte. Top next hops per packet. Top ICMP messages per byte. Top ICMP messages per packet.